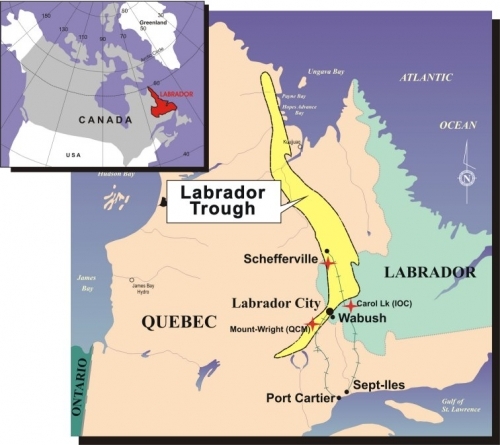 LIM's iron ore properties are located in the western central part of the Labrador Trough within the Province of Newfoundland and Labrador near Schefferville, Quebec. The Labrador Trough extends for more than 1,000km along the eastern margin of the Superior craton from Ungava Bay to Lake Pletipi, Quebec. The belt is about 100km wide in its central part and narrows to the north and south. The properties are variously located within 2km to 65km from the town of Schefferville and comprise twenty iron ore deposits discovered by the Iron Ore Company of Canada (IOC) during the period it operated direct shipping iron ore near Schefferville (1954-1982). The western half of the Labrador Trough, consisting of a thick sedimentary sequence, can be divided into three sections based on changes in lithology and metamorphism (North, Central and South). The Trough is comprised of a sequence of Proterozoic sedimentary rocks including iron formation, volcanic rocks and mafic intrusions known as the Kaniapiskau Supergroup. The Kaniapiskau Supergroup consists of the Knob Lake Group in the western part of the Trough and the Doublet Group, which is primarily volcanic, in the eastern part.